Most of the front of the phone is governed by the screen. The Note 8 have almost non-existent bezels on the sides of the phone, but do employ some small top and bottom bezels. Still, the phone sports a very elegant ergonomic design. 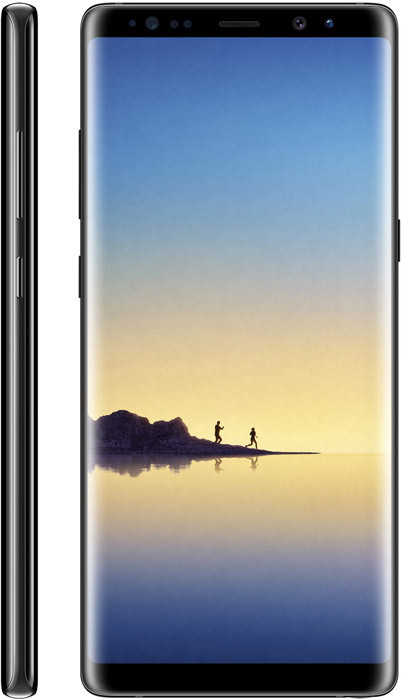 One of the main advantages of having a phone with ultra-slim bezels is that it allow phone manufactures to make large-screen phablets that are small and much easier to operate with one hand. The same goes with the LG G6 and Galaxy S8, and the Galaxy Note 8 walks in the same path. This is certainly the design of the future. The great thing is that the price for manufacturing this type of design is getting cheaper and this is why we already see affordable Android phones carrying the same bezel-less display. For example, the Micromax Canvas Infinity comes with the same gorgeous edgeless display and small top and bottom bezels, with the only caveat is the screen's low resolution. By the way, I've just read that there is a device called Doogee Mix that comes with a bezel-less design and it costs only US$90 (according to Forbes). This device was certainly influenced by the Mi Mix bezel-less phone. The Mi Mix still holds the crown for having the slimmest bezels and the Mi Mix 2 is going to be even sleeker than the first Mi Mix! Just look at the image below and see what I'm talking about, gorgeous bezel-less phone design! It's sheer beauty, this what it is. I know that my next Android phone that I'll buy will have this screen. Not sure whether I'll but the Note8, but I must have a phone with that type of edge-to-edge screen. I would be more glad to see those top and bottom bezels remove as well, but this is not the Xiaomi Mi Mix and if I want a truly edge-to-edge display phone, I'll probably should be looking at the upcoming Xiaomi Mi Mix 2. In the current design, you can still see that the top part is used to host the iris-scanner, proximity sensor, the LED flash and the front-facing camera. Of course to be able to remove those, Samsung needs to come up with unique innovative technologies that can put those things behind the screen. I don't see the camera going behind the screen anytime soon, neither the iris scanner. Even the Mi Mix has a bottom bezel that hosts the camera. I wonder if someday a technology comes that will enable the front camera to reside behind the screen. Maybe the appropriate solution is just to make a flip out camera at the back, maybe embed it inside the screen on the top part with just a triangle bezel visible.